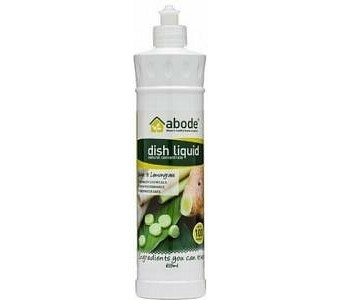 The Abode lemongrass and ginger dishliquid is a great smelling, creamy lathering liquid that has been formulated to be kind to hands and the environment but will effectively cut through grease just like the leading brands. The unique formula eliminates the need for toxic chemicals such as cocobetaine, sodium lauryl sulphate and ethoxylated ingredients and is designed to leave your dishes sparkling clean with no chemical residue. Developed using the highest quality ingredients money can buy, its concentrated formula makes it remarkably economical (100 washes). Ingredients: Water, alkylpolyglucosides (derived from coconut, wheat and corn and found in high end personal care products), sodium coco sulphate (derived from coconut oil), sodium cocoyl isethionate (derived from coconut oil), citric acid (food grade), sodium citrate (food grade), glycine extracts (amino acids) and pure lemongrass and ginger essential oils.